Following on yesterday’s post about sharing more of the overall health and wellness information I learned from my week-long stay at The Biggest Loser Resort, Fitness Ridge, today I’ll be kicking off a 3-part series on nutrition. Counting calories, or even just being aware of the caloric value of the food we eat is important, but where those calories come from (Fats, Carbs, Protein) matters most of all. Since we all just love to focus on the dirty boy in that trifecta [Fat], let’s start there shall we? So there’s good fat (believe it or not) and bad fat (quelle grande surprise!). 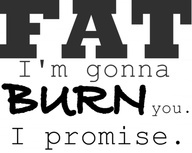 And the truth is, consuming the right amount of good fat can turn you into a wonderful fat burning machine. It can truly become a “miracle food” in that respect. What? You must be crazy, Nancy! No, I’m dead serious! The very well qualified nutritionists on staff at BLR told me so. They even told me 5 reasons to eat good fats! Your diet needs good fats in order to burn body fat. Eating good fats provides a more consistent level of energy. Your brain needs good fats to function properly. Good fats help you to feel satisfied and won’t leave you hungry. Good fats have great overall health benefits for your whole body. Isn’t this stuff fascinating??? No, like really, isn’t it? It certainly was eye-opening to me! Good fats include: Monounsaturated, Polyunsaturated and Good Saturated. The ones listed below are examples of the optimal fat to incorporate into your daily diet. But Fat can also live up to its bad-boy image. Oh yes it can… namely in the form of Hydrogenated, Trans Fat and most Saturated Fat. The great news is, in now knowing about the good fats, and why they’re so important to our diet, I am now making better, smarter and healthier choices. My biggest takeaways that I’ve incorporated into my real life on a daily or near-daily basis are: coconut oil and chia seeds. 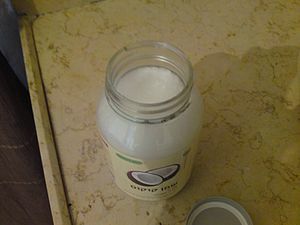 Coconut oil is FANTASTIC!!! Like hallelujah, the skies just opened up and a divine being just dropped this manna straight from the heavens, fantastic! I use it to cook with, because a) it’s good for me; and b) it tastes great! And to quote the Russian Princess, “It looks like lard, and that makes me happy.” 🙂 God, I adore this girl! Oh, and did I mention, coconut oil is also wonderful for your hair (conditioner), your skin, even my antique dining room table got a new lustre after I rubbed a glob of coconut oil onto it! A miracle food! I love it!!! Chia seeds are another easy-peasy thing to incorporate into your daily regime. I sprinkle them on salads; I add them to smoothies; I pretty much throw them on or into just about anything. They remind me of poppy seeds! 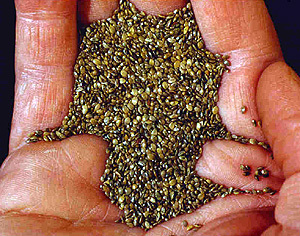 Chia seeds are great because they don’t really have a discernible flavour; at least not one that has left an impression on me. So, it’s really some added texture they provide (to salads, etc.) – in addition to being a wonderful addition of good fat to your diet. And that, my friends, is the skinny on fat! There’s always frozen yogurt. Although, I’m not sure it’s that much healthier an option. 🙂 Oh well, another hour on the elliptical should do the trick! I don’t overindulge on it, so when I have it, I like the real thing. Slurp. Pingback: This is me | My Year of Sweat! | Hey Sweetheart, Get Me Rewrite! No quitting!! Thanks for stopping by! Pingback: Giving props to the pro in Protein | My Year of Sweat! Pingback: Oh Carbs…How I love and hate you! | My Year of Sweat! So glad you referred me to this! I will definitely hunt for chia seeds. There are a few things you mention that I think I might like to question. 1. Animal fat is bad. Ummm … based on the research I’ve been doing, animal fat is good, PROVIDED the animal in question has been raised on pasture (not grain) and not pumped full of hormones, etc. When beef goes to a feed lot it gets fed a lot of gross stuff to make it grow, and the fat stores those nasties. However, steers like our pretty boys, who get hay through the winter and rich pasture the rest of the time and are bumped off with a minimum of fuss right here at home, have only good stuff in their fat. 2. Lard is bad. Again, based on my research, CRISCO is bad. Lard from pigs that have been abused and fed substances that we wouldn’t want to consume is potentially toxic. However, leaf lard off the kidneys of a free range pig (preferably pasture-raised) is great stuff. I have a big bag of it in my freezer and will blog about it when I get around to rendering it. It’s just a pity that my new carb-free approach to food won’t give me much opportunity to test it in pastry-making; it’s supposed to be wonderful. 3. Cream and butter – same as above. As I understand it they’re not at the top of the good fats list, but if you can get them from grass-fed, naturally raised cattle, they’re fine. 4. Canola oil – I can’t speak definitively about this, but I’m suspicious of it because I don’t believe it’s real food. As I understand it many of the vegetable oils are so heavily processed that they’re not like the original substance in the plant, so I avoid them. 1. Animal fat is listed under the good fats section (saturated list) – providing it’s organic – do I think we’re on the same page on thus one. 2. I’m not sure there’s a nutritionist in the world who’s going to recommend lard, regardless how organic the pig it come from, as a healthy source of fat, BUT if it works for you, carry on, sister! 4. I don’t use canola oil personally, but it did appear on the list of good sources from the nutritionists and dietitians on staff. 5. Have never used palm oil. Same as #4. The purpose of this post was to share the learnings I’d taken away from daily lectures at the resort. (When we weren’t exercising 6.5 hours per day, we were eating healthy meals and participating in cooking classes and lectures on nutrition and lifestyle. My takeaways were things like coconut oil and Chia seeds, as well as adding more walnuts (a super food!) 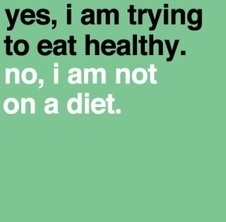 Into my diet.